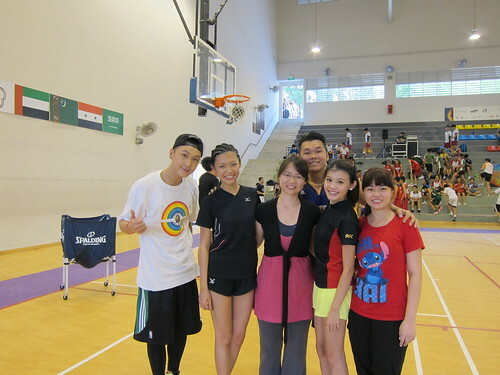 Basketball shooting in Orchard Road?! The only sport I ever considered doing in such a place is (i'm gonna sound like a bimbo but i don't care) SHOPPING. I DO know friends around me, many of them, participate actively in regular sports and exercises, mostly jogging and marathons. I know Cheryl Tay and Christine Ng did Bikram Yoga. 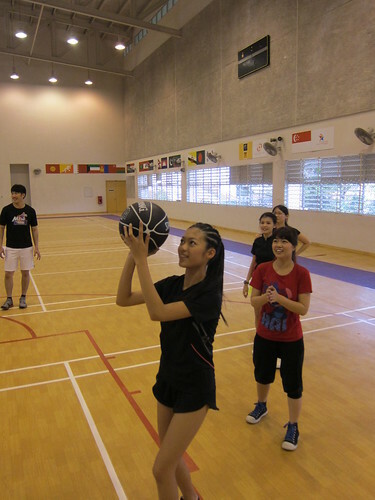 Sharlene, my good friend since secondary school, does Muay Thai, then a group of them was so into wakeboarding and so many others to name but basketball lovers? 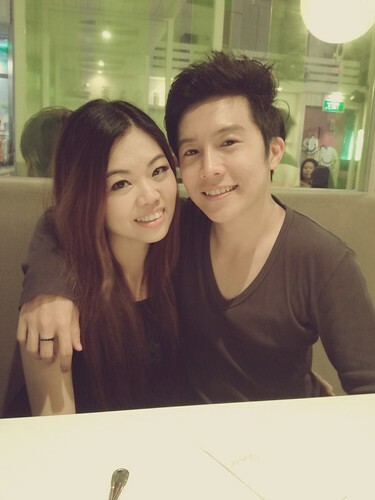 Hmmm... perhaps the only friend I can think of for now is Smith Leong. How do you think the response was like for MEon3 then? Make a guess first before you scroll on. ANSWER: The response was so overwhelming that ALL 200 team entries were filled up before the closing date! 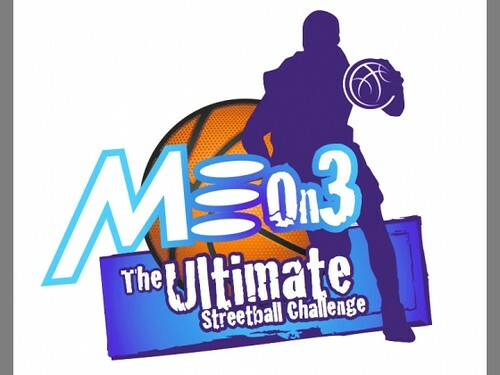 MEon3 The Ultimate Streetball Challenge is one of Singapore’s biggest 3-on-3 competitions which will be held at Ngee Ann City Civic Plaza on 15 and 16 June 2013. Divided into different categories, the top three teams from each category will win sports apparel vouchers worth S$1,000, S$600 and S$400 respectively, while the top eight finishers will be entitled to a special prize. 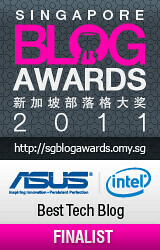 The registration is closed and you couldn't take part? Don't know how to play basketball? 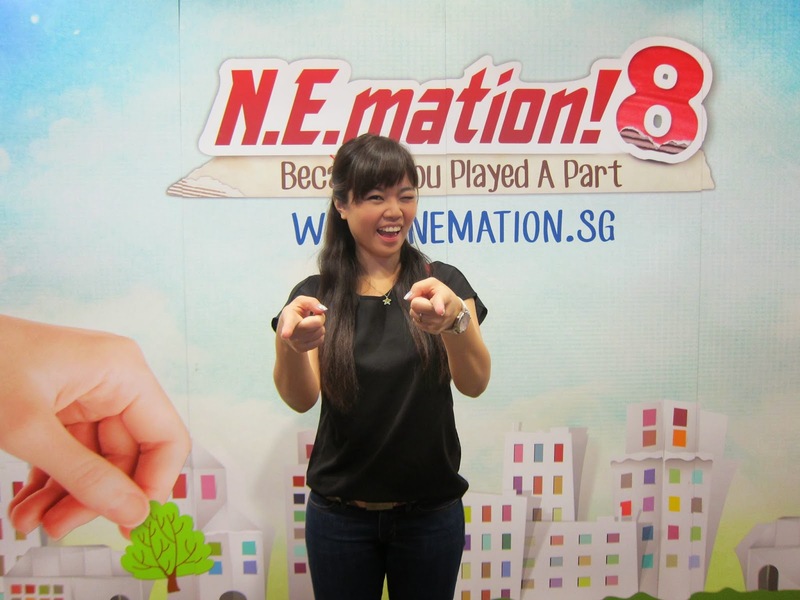 Star-struck or just want to Kpo-Kpo? Whatever the reason is, friends who come down on both days will not only be able to watch the matches, we'll also enjoy fringe activities at Ngee Ann City Civic Plaza between 10.30am to 6pm. 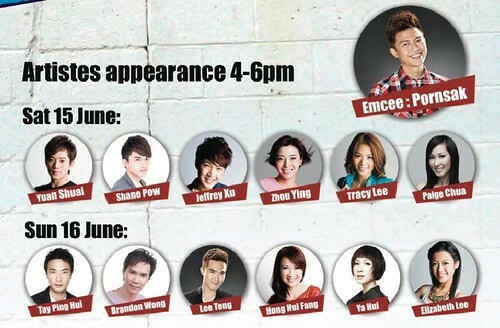 MediaCorp stars Tay Ping Hui, Lee Teng, Brandon Wong, Yuan Shuai, Shane Pow, Jeffrey Xu, Ya Hui, Elizabeth Lee, Tracy Lee, Paige Chua, Zhou Ying and Hong Huifang! The emcee alone owns my world immediately. I wish I can be there right now to be influenced by Pornsak's bubbly voice right now. The love for sports runs in my family. 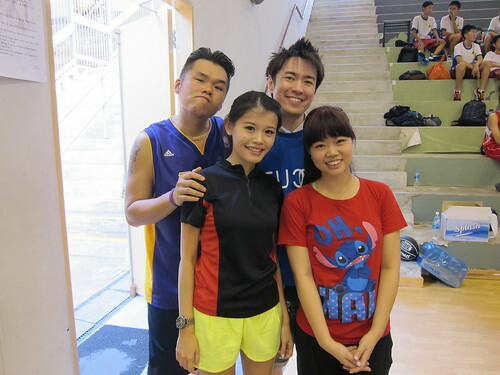 My uncles are badminton champions while my aunts and mummy played volleyball for years during their school days. When I was younger, we used to organise family outings like bowling, cycling, trekking and badminton sessions for the cousins and siblings. I LOVE sports but I admit, I can't play them well. 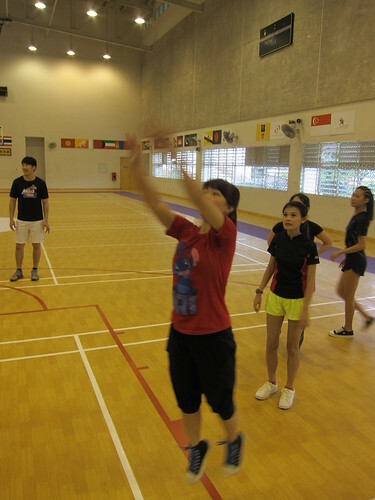 During my school days, I've tried basketball, captain's ball, netball, floorball, poison ball, women soccer, girl's rugby, bowling etc. 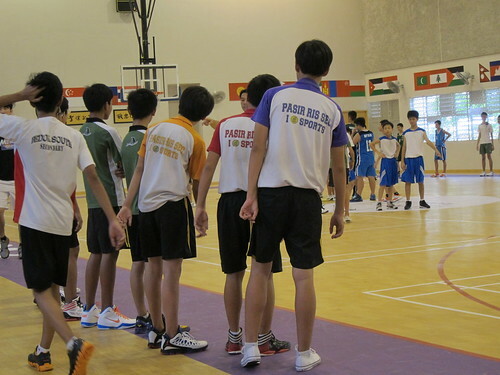 during PE lessons. I even took up golf. However I always end up with injuries such as a muscle tear, ligament tear, broken toe nail or/and crooked spectacles. Later, I fell in love with leisure ice-skating, pool(snooker) and para-para dancing in secondary four. There was also DDR (Dance Dance Revolution). Aw come on, these are some forms sports too right- dance and skating? 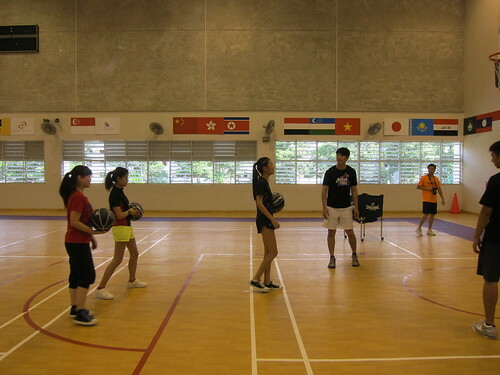 To get myself warmed up and to revive those slam-dunk-craze days, I attended the Meon3 Basketball Clinic held at Anglican High School on Monday afternoon. 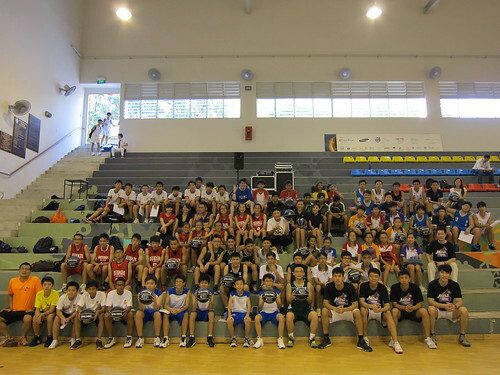 Secondary School Students, both guys and girls, from about 20 schools located in the east of Singapore were present for the basketball clinic too! As I stepped into the school, I tweeted to my music classmate Jona. 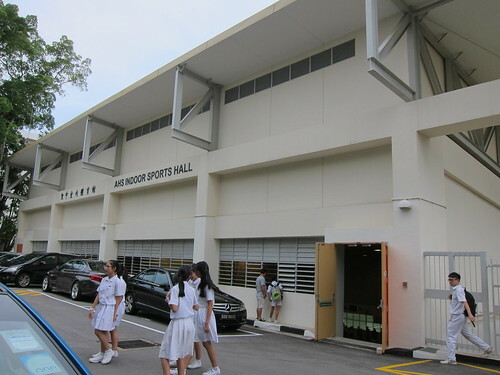 She was extremely excited because it's her secondary school. 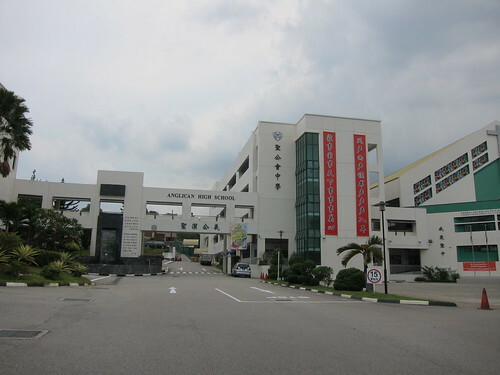 She asked me whether her's school beautiful. It's also big and spacious. 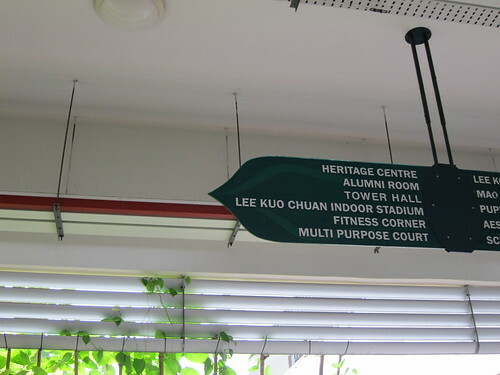 To Lee Kuo Chuan Indoor Stadium for the MEon3 Basketball Clinic, chiong ah!!! 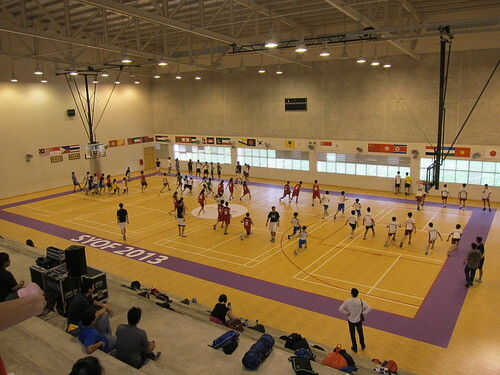 The students were already doing basketball drills and warm up exercises. I got to know the names of some popular basketball players and receive updates on how the basketball scene is like. 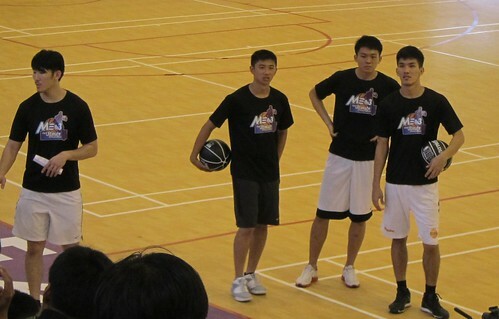 One of the names that remains vividly in my head is Steven Khoo who played for Singapore Slingers. What impresses me most about Steven is his ability to double drill; meaning he can bounce 2 basketballs, 1 in each hand, AT the same time! The Singapore Slingers is a professional basketball team that currently competes in the ASEAN Basketball League. 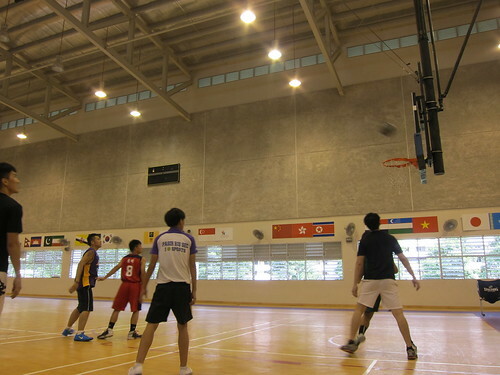 The basketball club formerly competed in the National Basketball League in Australia. It is the first - and so far, the only - Asia-based club to compete in the NBL when they joined at the start of the 2006/2007 season. 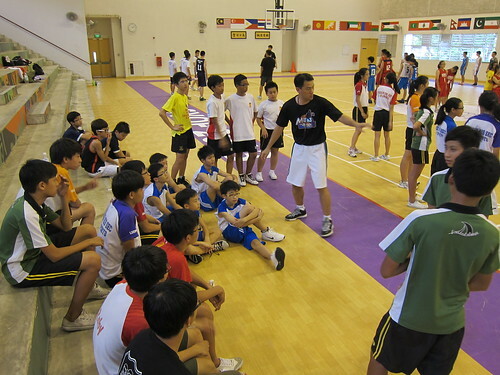 The students are so BLESSED because the coach-of-the-day is none other than the Malaysia's National Basketball League (NBL) commissioner, Tan Kee Hian. 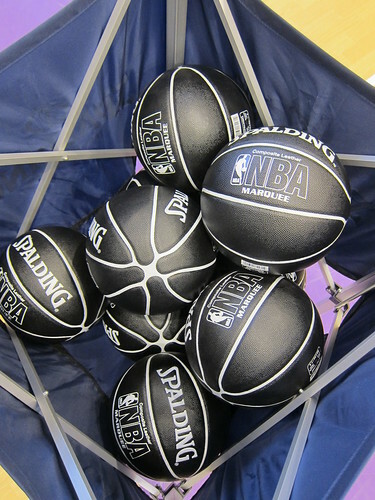 Hello, I'm ready for some bb practice with the official Meon3 game ball, Spalding. 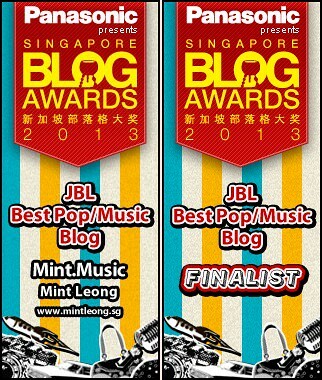 (Left to right) Smith Leong, Maybeline Sim and Benjamin ChocolatePistol. Maybeline told me her peers in school couldn't recognise her in her fitness outfit! 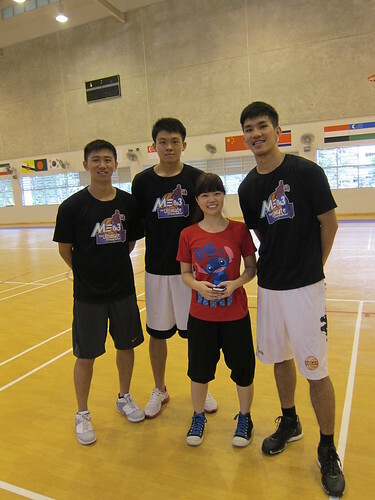 Two special celebrity-guests Elizabeth Lee Qiao Er and Jeffrey Xu Ming Jie was invited to have a game with the students. 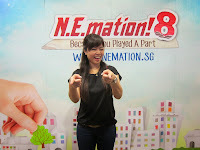 During a short interview with Jeffrey Xu and Elizabeth earlier, they are extremely excited to be part of MEon3. Inspired by the Japanese anime Slam Dunk when he was younger, Jeffrey still plays basketball with his peers sometimes while Elizabeth finds MEon3 meaningful as she gets to keep herself fit via playing a sport. 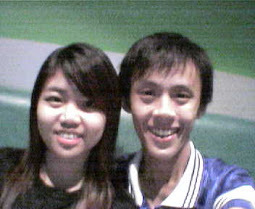 Both of them voluntarily signed up to be part of MEon3. From the conversation, anyone can easily tell just how much both Jeffrey and Elizabeth are looking forward to 15 and 16 June! Left to right: Benjamin, Jeffrey, Elizabeth, Smith and me. After more than an hour of warming up exercises and drills, it's match time! 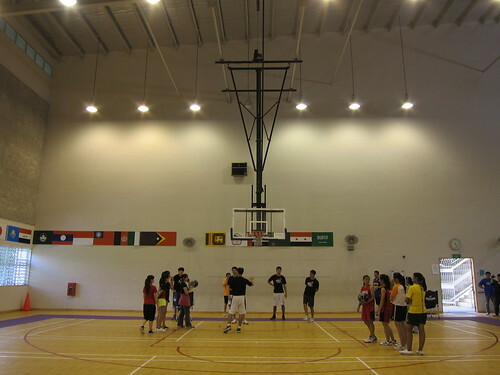 The students were invited to team up with Jeffrey to play a friendly 3-on-3 match, 5 points to win. Jeffrey's team won! 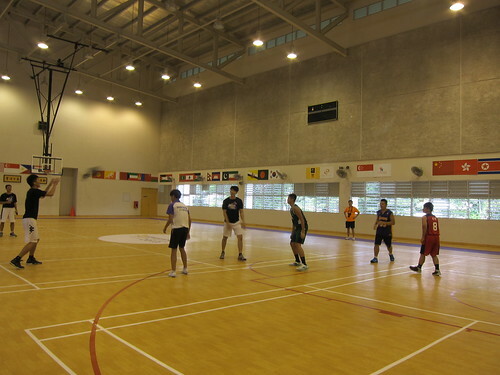 Then, Smith was invited to team up with the Singapore slingers to compete against the student's team. Just to make it more interesting, the student-players will have to do 5 push-ups should they lose the match. However, Smith and the Singapore slinger players had to do 10 push-ups for EVERY BALL they lost. Anyway, it was two friendly matches but super exciting to watch! The LIVE ambience in the court is so different from watching on television. 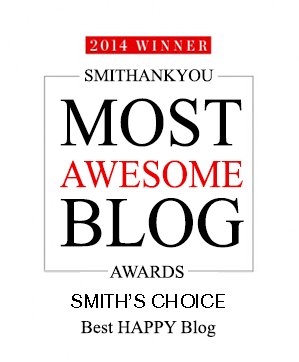 I screamed a lot to support and cheer for Smith until Maybeline is most probably suffering from ears-ringing. OPS. In the end, TEAM SSS WON by 1-point (from what I remembered). Thankfully it was much easier for the girls. Elizabeth, Maybeline, a basketball teacher and I didn't know/ didn't know much about basketball so we were given something easier to accomplish -- aim and try to score points by shooting the ball into the basket from a distance. Praying for Elizabeth to score. Everyone was so engaged. You can hear "ooooooooooo... Aiya" from the crowd when no one manage to score, or a cheer and some applause from the spectators when someone scores. The anticipation of basketballs to go through the basket so as to score. Happy faces filled up the sports hall; simple joy of life. 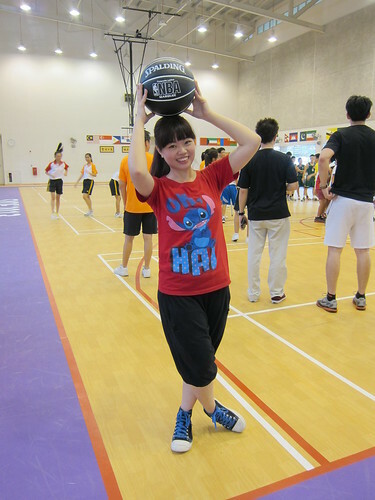 I HAD A HAPPY TIME WHILE KEEPING FIT. 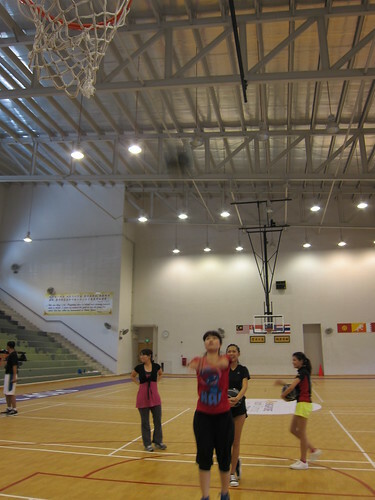 Got the urge to play basketball! I'm so petite standing next to them! 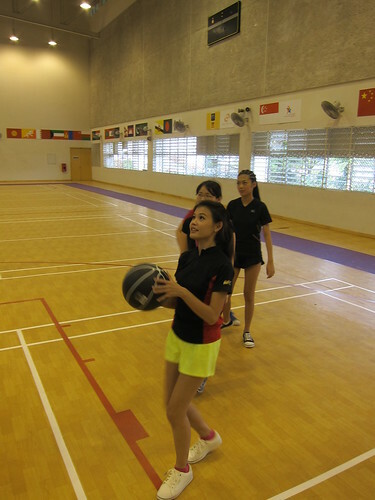 Come down and immerse yourself in fun and sports. Cheer for the players, play the games, it's for the whole family! 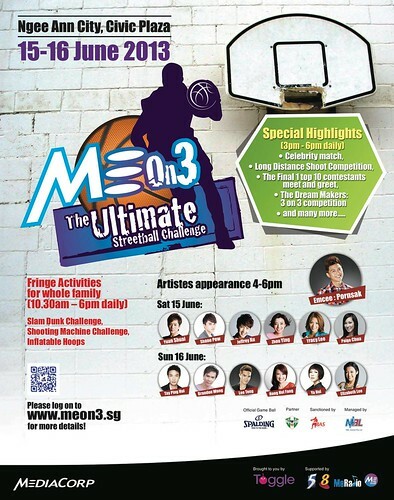 I'll be there for #MEon3 on 16 June 2013, Sunday. 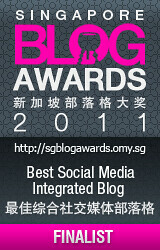 Visit http://www.meon3.sg for more information.